This holiday home is located near a child-friendly pebble beach in Krusevo, a suburb of Meka Draga. It consists of two separate housing units connected by external stairs. This holiday home is located near a child-friendly pebble beach in Krusevo, a suburb of Meka Draga. 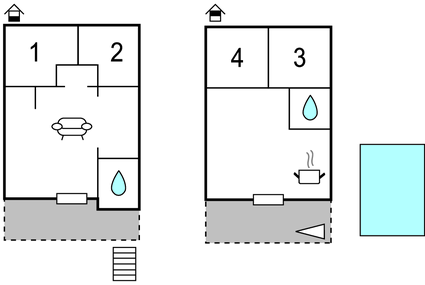 It consists of two separate housing units connected by external stairs. The terrace offers views of the sea and the surroundings. Meka Draga is a small town maintaining a low profile. The movie "Winnetou" was filmed in the vicinity. Rafting trips on the nearby Zrmanja River, mountain climbing and hiking in the Paklenica National Park and the Cerovac Caves are highly recommended. This modern villa is made from brick or stone and was recently built in 2010. The agent has rated it as a three star property so it is a well-kept villa, equipped with standard furniture. It is also good value for money. This villa has a swimming pool and sea view; it is also located in Kruševo, 40km from Zadar. It is set in a very convenient location, just 130 metres away from a stone and pebble beach. There's also a restaurant 2km away.